Paint in heavy impasto techniques without wasting valuable pigment! Layers will dry without shrinking, cracking or wrinkling! Dries at the same rate! Paint in impasto layers up to an inch thick! Not only dries faster but can double your colored pigment! Thickens the paint and makes it so much easier to use a palette knife. 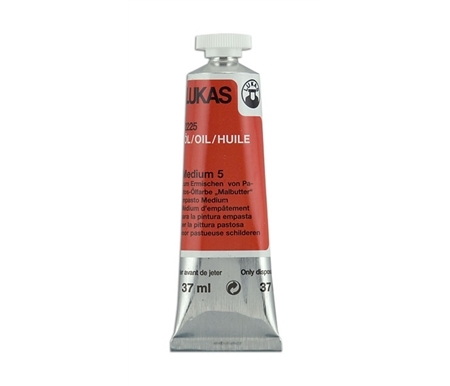 Paint in heavy impasto techniques without wasting valuable pigment with this quick drying, elastic, alkyd resin-based Painting Butter medium from LUKAS! Formulated with special drying agents and thickeners, this impasto medium helps keep the thick constitution of heavy paint application with no leveling, ensuring that your paint structure remains. An indispensable medium for the oil artist fond of impasto and palette knife painting techniques! I love Lukas Painting Butter, both for my own work and in my workshops. It's heavy texture and FAST drying time are "just the ticket" for my "knife paintings". I have turned many of my students onto it, too! It's now a staple of my "must-have" supplies." LUKAS Painting Butter Impasto Medium is rated 4.8 out of 5 by 33. Rated 5 out of 5 by Ter Boscj from good design Convient way to carry a palette and paint on lap, table, of French easel. Rated 5 out of 5 by ccphillipsart from Speeds drying in impasto REALLY QUICK I've purchased the Lukas Painting Butter for several years and always come back for more. The main reason is really thick oil paint needs STABILIZATION so it won't crack over time. Cobalt and Japan driers will make oil impastos crack guaranteed!!!! Rated 5 out of 5 by DeanaEve from Love it for impasto work Painting butter works fantastic for impasto technique extending oil paint colours without altering depth and shade. It’s not runny and keeps brushmarks and palette knife shape as you intend it to be, it dries very fast and great if you are building up layers. It’s a little on the nose and need a good ventilated area to work with it. Rated 5 out of 5 by Bree from Great stuff. I use this to thicken up runny or soft oil paints. It doesn't take much and it makes a lot of difference for the kind of painting that I like to do which is normally large brush type landscapes. It is also very good for really kicking up the thickness for knife work on cool abstracts. I don't know what's in this stuff but it works like a charm. I recommend it. Rated 4 out of 5 by Adan from Still learning to use this but very pleased so far Other than it drying faster than I anticipated (thus the 4 vs 5 stars), I’m learning to find the right uses for the Lukas Painting Butter. The big tubes are easy to use, so the savings is a big plus, plus the paint spread and texture effects are just plain fun. The color definitely is staying quite vibrant, another big plus. It could be I’ll eventually become comfortable enough to rate this a 5, but that’ll come with time. Definitely worth buying and trying! if i mix regular oil paint with alkyd medium will I get alkyd oil paint? Yes, you can do that. This article might help you also https://garybolyer.com/2011/07/18/4-keys-to-understanding-alkyds-in-oil-painting/ You may find that mixing a little alkyd medium into your regular painting medium and using that combined with your regular tube oils is the right choice for you. This method allows you to control exactly how much drying time you need by adjusting the amount of alkyd. Please let us know if you have any other questions or concerns. 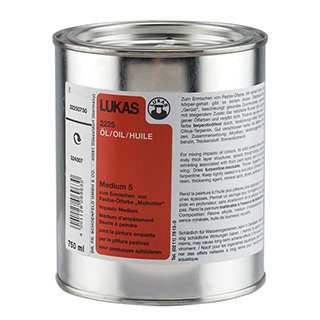 Can Lukas painting butter be used with Lukas water mixable oil paints? No, since the Lukas Berlin water mixable oil paint is alkyd based you should use an alkyd impasto medium. I would suggest that you look at Winsor Newtons Artisan WaterMixable Oil Color Impasto Medium item number 50102.